Originally from the Limoges region in France, the name of this dish comes from the Occitan word clafotís, from the verb clafir, meaning "to fill up" (here: "the batter with cherries"). 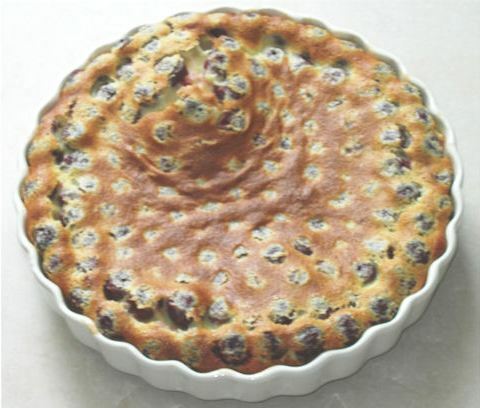 Clafoutis apparently spread throughout France during the 19th century. This traditional dessert combines all the best qualities of custard, pudding, and cake. When fruit other than cherries is used, it is called a "flognarde". With prunes, it is basically a "far breton". Keeps well, but won't last long! I use a big jar of pitted griottes cherries on light syrup. These are sour "morello" cherries. I like them best. Fresh or frozen bing cherries or other sweet cherries might also do. Do not ever use (or even buy) those pie-filling cherries that are canned with disgusting goo. Again: do not beat for minutes, as the batter will get frothy and the top of the clafoutis will be "spongy" upon baking. Carefully pour the batter over the cherries. They may tend to float, but that is OK.
Bake for 35-40 minutes, until the top is dark golden. As stated above, it may be that the top (just the top couple of mm) remains a little "spongy". This happens if you beat to much air into the batter. It will still settle some, when cooling down. If worried, just turn off the heat and let the clafoutis coast a while in the oven. May be served lukewarm. Do not serve cold, straight out of the refrigerator! With large seedless grapes (until recently, not easily obtained in... France) instead of cherries, it also turned out well. One of these days, I will try one with Armagnac-soaked prunes. I have made the same recipe with small blueberries (I used frozen berries; thaw out completely, drained well, and even squeezed out most of the juice). Not great, and I do not recommend it.